“Rendezvous” consists of three seemingly random vignettes which share no connection save for their neighborhood. But there's nevertheless a certain order to them, as each corresponds to various relationship stages. As such, the first takes place at the beginning of one, the second in the middle, and the third just as another is ending. Appropriate for an opening adjacent to Valentine's Day, there's an underlying sweetness to each of the segments in “Rendezvous in Chicago,” even in the section that sees its central relationship end. It isn't just schmaltz though, as each one is smart in each own way, with a more unique setup and a gift for dialogue that manages to make us feel like the various conversations are ones we'd be happy to eavesdrop on. The first takes place in a bar that alas is not one we can visit, at least not as it appears in the film, which happens to just be one of the most charming bars I've ever seen on-screen. Sadly, its interior, with its warm, atmospheric ambiance that includes candlelight via wine bottles is mostly due to production designer Haley McCormick, who also has a small, yet memorable role as the Inappropriate Babysitter in a brief flashback. In a sense, the relationship that kicks off “Rendezvous” takes more than a few familiar turns, only to veer off in a more unexpected direction. Unexpected in that Delaney (Clare Cooney), the woman who is approached by Paul (Kevin Wehby), decides to test her would-be paramour's professed love of Russian novels with a game of literature strip poker. The second relationship is simplistic, yet nevertheless is a refreshing change from the heteronormativity that tends to dominate love stories on-screen, as the blissfully in love Rob (Matthew Sherbach) and Andy (Rashaad Hall) walk around Rogers Park, admiring each of the adorable dogs they encounter, and musing on the difference between cats, dogs, and the people who love them. It soon becomes clear that they may be preparing to take the next step...but what is that step exactly? Buying a dog? A cat? Both? Or something even more romantic and life-changing? 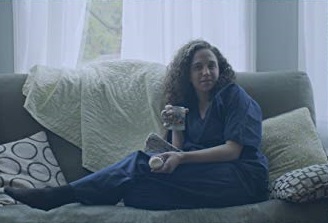 The third and last segment first appears to head back to basics, as it sees its hetero couple part ways due to hospital worker Julia (Nina Ganet) coming home and finding her boyfriend Wyatt (Shane Simmons), in bed with another woman. Once she angrily throws Wyatt out, Julia begins to muse about life and love...to the camera, not only inviting us to make a different kind of connection with the characters we see on the big screen, but acknowledging the voyeuristic nature of how we experience the love stories that blossom or combust on it. And as Julia surrealistically begins to finds her joy again, so do we. It's light fare without feeling dumbed down or pretentious, even with the shout-outs to more obscure (ish) cinema and Smith's previous work, which includes one character typing out the ending to “Mercury in Retrograde” and Wyatt, who is himself a character from “Mercury,” and who's apparently learned nothing since. Anyone who comes across it should find something to like, but the Chicagoans it's obviously meant for will find plenty to love.